The concept of “If you build it, they will come,” doesn’t always work in business. There are no “set-and-forget” benefits from just posting a website. And simply being the good (the best, maybe even great) healthcare provider in town is no assurance that consumers will know it and lineup at the office door. Worse, we’ve seen a doctor, hospital or medical practice create a whiz-bang (and sometime expensive) website, and look for immediate and explosive response. Magic is expected from the website alone, but mostly things just go cold. Inquiries do not appear spontaneously and the appointment calendar does not burst at the seams. Of course, digital marketing and advertising are neither simple nor automatic. Success follows when a well-designed online plan creates a bridge between the prospect’s wants and needs, and the provider’s unique ability to deliver timely answers or solutions. A landing page for a website (often more than one) is a conversion workhorse. The broad definition is any page where the site visitor initially “lands.” From a general Google search, that might be a HOME page. But the marketing definition of a landing page is specific to one purpose. It is a stand alone page that supports a singular advertising or promotional objective. For example, the landing page for a PPC advertisement would likely be a page that continues or extends the benefit of the PPC ad. It presents convincing information and converts the inquiry to a lead or prospect. It’s important to note again that there could be more than one landing, each facilitating an independent or unique objective. Landing pages may vary in form and format, but think of it as larger, take-action advertising space. The page is an opportunity to convince the prospect to click through to the shopping cart (the buy-now purchase opportunity), or to register prospect information (buyer/lead capture) for subsequent follow-up. Immediately compelling headline: The head, and possibly a subhead, have to be a grabber that is enticing from the start. Benefit, benefit and benefit. The reader needs to know what’s in this for them. Explain how these features help them or answer their need. Use supporting details along with a summary list of bullet items. Picture this. Create an original and visually interesting image that illustrates the product/solution, helps tell the story or shows the benefit. A short video presentation on a landing page dramatically increases attention and conversion. Include the social proof. People want validation that others are doing the same thing. Demonstrate how other customers have participated using testimonials, case examples, reviews and comments, and response statistics, for example. Focus on the one and only thing. When you have more than one thing to offer, create a landing page for each. Don’t distract or confuse the reader with multiple or competing ideas. Be specific and limit the directive options for the visitor. Provide a clear Call-To-Action. The primary purpose of a landing page is to convert the visitor to a buyer or to capture an active lead. The visitor should have no doubt as to the next step, so the CTA needs to be strong, obvious and eye-catching. The directive might be to sign up, make an appointment, redeem an offer, register here, watch a video…or another action step. An essential part of any campaign or plan includes a dedicated landing page. Simply informing the public, or presenting generalize capability statements, can be instructive, but that alone does not create leads, responses or in-office appointments. If you have more than one objective, create a dedicated landing page for each. 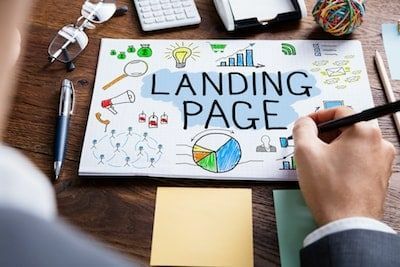 The landing page is the connecting bridge between the online, digital marketing message and the visitors’ all-important next action step.